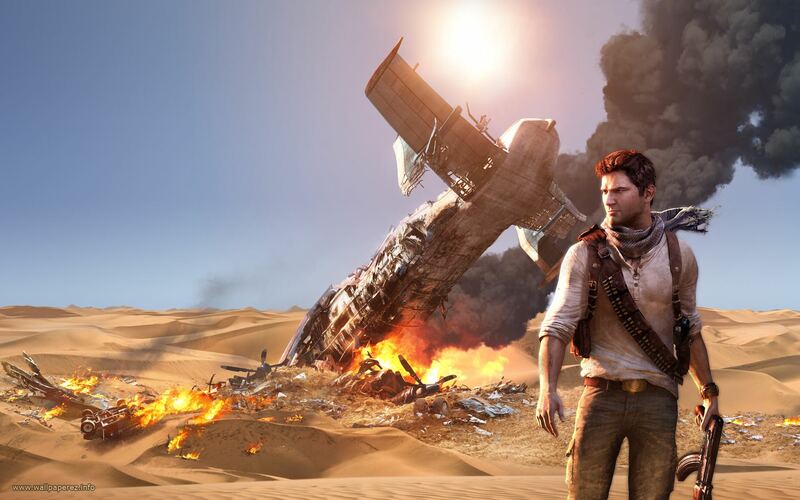 The Refined Geek » Uncharted 3: Same Old, Same Old Drake. Uncharted 3: Same Old, Same Old Drake. It’s not often that you see games stay as platform exclusives, especially successful ones. Since many publishers look to maximise their profit on any set of intellectual property a cross platform release, usually across the big 3 (PC, PS3, Xbox360), is inevitable especially if the franchise is successful. The Uncharted series from Naughty Dog is something quite special as whilst it has enjoyed success similar to that of say Mass Effect it has remained a platform exclusive for every release . 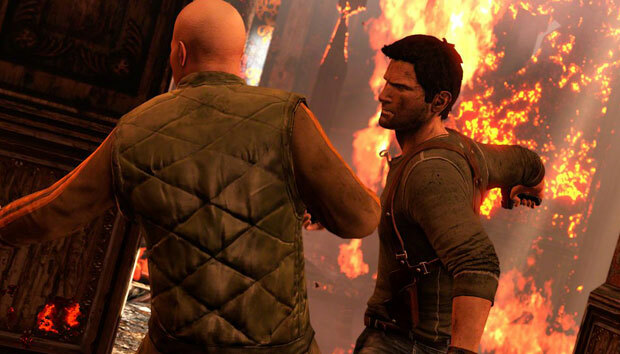 The third instalment in this series, Uncharted 3: Drake’s Deception, is no different and picks up sometime after the events that took place in Uncharted 2. As in all Uncharted games you play as Nathan Drake, a rough and tumble treasure hunter with an eye for hunting down treasures hidden by one of his ancestors Sir Francis Drake. This time around Drake is investigating why it took his ancestor so long to sail across the east indies when he could have done it in a fraction of the time. This leads him on several quests to find the various items required to retrace Drake’s path and hopefully discover the treasure that remains hidden there. People from his past come back to haunt him in this adventure though and much of the back story between Drake and Sulley which hadn’t been explored up until now. 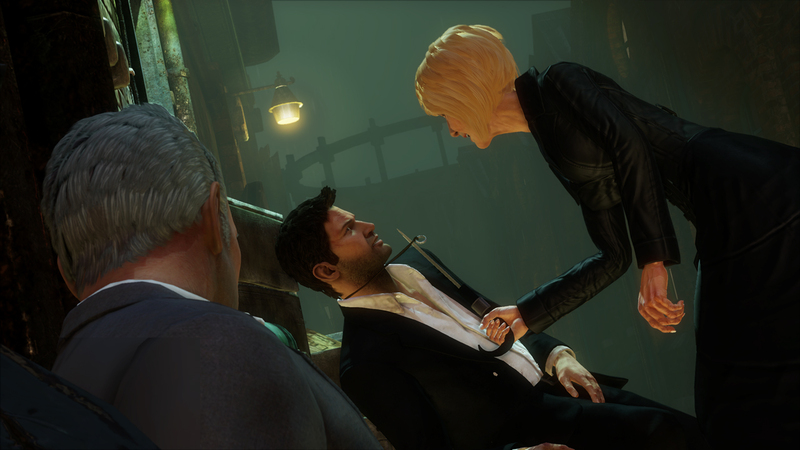 The Uncharted series has a reputation for being on the pretty side and Uncharted 3 is no exception. Whilst there doesn’t seem to be a vast improvement from that on previous titles there’s still some noticeable differences when you compare them side by side. It’s mostly in the small things like Drake’s face having a lot more detail to it. Since this is their 3rd release on the platform it follows that they’re probably pushing right up against the PS3’s limits, especially when the game ran as well as it did (I never noticed any slow down). Naughty Dog also get points for getting the lip syncing and motion capture spot on, something that too many games get horribly wrong. 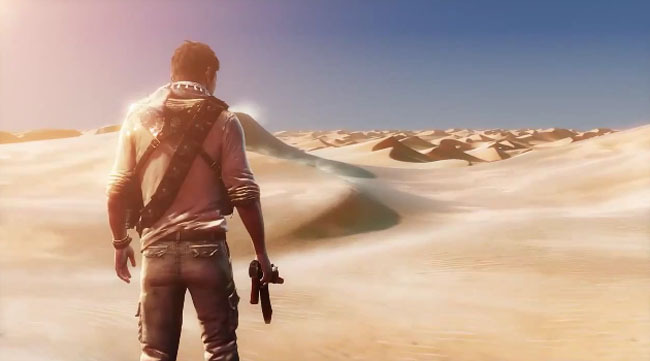 Uncharted 3 retains the winning, Tomb Raider-esque game play style that has made it such a hit with its fans. Nearly every part of the game is filled with platforming sections, elaborate puzzle sequences, cover-based combat and a few quick time events thrown in there for good measure. Indeed at this point I’m willing to say that Uncharted is quite formulaic in its approach as the parallels you can draw between this latest instalment and its two predecessors is quite startling. This isn’t to say that there’s anything wrong with it, Uncharted is successful for a reason, but this means its in the same category as games like Call of Duty. For some that will be off putting and I can understand where they’re coming from. Now I’m not sure whether this has anything to do with me getting better at the Uncharted games or not but this time around I rarely struggled with any of the platforming or puzzle sections. The platforming sections really are just an organic progression blocker as Drake has very obvious queues about whether or not he can make it to the next ledge or not. It also seems that the developers, whilst keeping in the old hint system to help you get past a section should you get stuck, have made the NPCs that accompany you far more chatty when it comes to solving problems. Again it could just be me picking up on it more but it really did seem like the game’s overall difficulty had been taken down a notch or two. Combat in Uncharted 3 is fast paced and action packed but felt like it suffered due to the inherent inaccuracy of doing a shooter on a console system. Now this could just be because I prefer the mouse and keyboard (and I could just shut up and buy the right peripherals) but most games like this compensate for that by helping you out a little, usually by locking onto the target once you get your sight in right the first time. Still there are times when I’d do a section and lay waste to an entire horde of baddies without breaking a sweat but it was just as common for me to struggle with bad aiming and misplaced grenades (is there a way to cancel a grenade throw? I couldn’t figure it out). The quick time events also felt well placed for the most part, enabling Uncharted 3 to retain that movie level feeling whilst still letting you feel like you were in control of the action. There were a couple that dragged on for far too long however; long enough for my wife (who loves watching me play games like this) to leave the room and say “Call me back when this section is over”. It’s what my friends have come to call Epicness Fatigue when something is just so epic for so long that you get bored with it and just want it to be over. The game definitely didn’t need to be padded out at all, I mean its a relatively short game but still almost double the length of any recent FPS, so the few drawn out action sequences don’t do Uncharted 3 any favours. The development of Drake and Sulley’s backstories was quite refreshing as it was something that was overlooked in the previous two releases. Up until this game I had just assumed that they were business partners of a few years and nothing much more than that. The story of Uncharted 3 reveals that they’ve been together for much longer than that which, if you retcon that back into the prequels to this, makes some of the decisions made by those characters seem very unusual. Still the backstory is tied in very well with the main plot so it works out anyway. Overall the story is quite good, well above what you’d find in other games of similar calibre. Whilst I didn’t feel the same level of emotion as I have for other games I did genuinely care for the characters and hoped that certain events would unfold in the way that I wanted them. True to its Hollywood styling there’s an ending that’ll make everyone happy and thankfully doesn’t loudly declare that you should wait for the next one to come out. Undoubtedly there will be another, I believe Uncharted is to the PS3 as Xbox is to Halo, but a game always gets bonus points from me when they can wrap up the main story line like that. Uncharted 3 might just be another instalment in a series that’s found its success formula and is sticking to it but that doesn’t detract from the fact that it’s just a damn fun game to play. Whilst none of the individual components stand out on their own as something revolutionary the seamless combination of all them comes together that makes something that’s greater than the sum of its parts. If you’re wondering why some people buy a PS3 over another console Uncharted 3 is definitely something I can point to as an example of what gaming on the platform can be like and indeed the Uncharted series is a great benchmark with which to compare other titles on the PS3. Uncharted: Drake’s Deception is available on PS3 right now for $78. Game was played entirely on the medium difficulty setting with around 12 hours of game time and approximately 30% of the achievements unlocked.